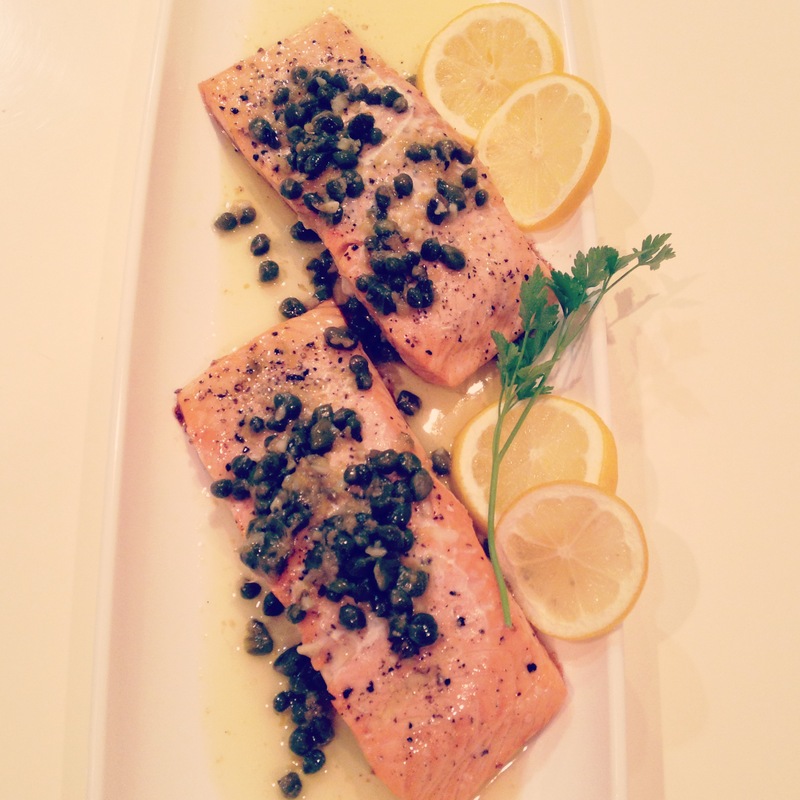 Salmon baked with a decadent lemon caper butter. 2. Line a baking sheet with aluminum foil and spray with non-stick spray. 3. Place salmon fillets on the prepared baking sheet. (Note: I don’t like the bones so I remove them. Some use needle-nose pliers, I used my finger nails but it did take me a little while). Sprinkle fillets with kosher salt and fresh cracked pepper. Place 2 lemon slices on top of each fillet. Bake for 10 minutes. Remove and tent with aluminum foil for 10 more minutes. Fish will continue to cook during this time. It will flake easily when done. 4. While salmon is cooking, in a small sauce pan, melt butter over medium heat. Once butter has melted add garlic, capers, lemon zest and lemon juice. Cook for 2 minutes. Season to taste with salt and pepper. 5. Remove lemon slices and discard. Gently slide a turner or serving spatula between the skin and the flesh of the fillet to remove the skin, it should separate very easily. Transfer fillet to a serving platter and spoon lemon caper butter over the top. Serve.